If there’s one thing Don Jr. loves more than the phrase “the fruits of my father’s labor,” it’s meetings. Don. Jr. simply loves meetings! 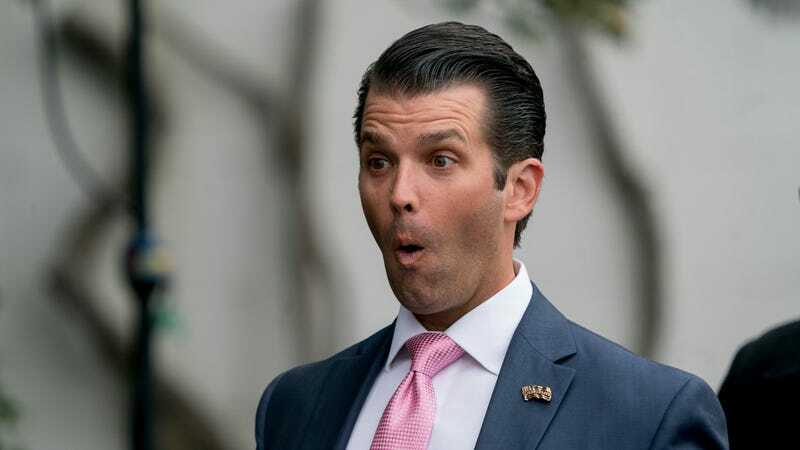 Don Jr. was present at that meeting at Trump Tower in 2016, along with Paul Manafort and Jared Kushner, in an attempt to get damning information about Hillary Clinton from sources connected to the Russian government. One imagines Don Jr. has attended a fair amount of meetings surrounding his forthcoming divorce. Now we know that over the summer of 2016, three months before the dreaded election, Don Jr. had some more meetings, with some other interesting people! The emissary, George Nader, told Donald Trump Jr. that the princes who led Saudi Arabia and the United Arab Emirates were eager to help his father win election as president. The social media specialist, Joel Zamel, extolled his company’s ability to give an edge to a political campaign; by that time, the firm had already drawn up a multimillion-dollar proposal for a social media manipulation effort to help elect Mr. Trump. The company, which employed several Israeli former intelligence officers, specialized in collecting information and shaping opinion through social media. This meeting is the first real indication that a country other than Russia showed any interest in assisting the Trump campaign with their nefarious plan to win America, and are also reportedly a focus of Robert Mueller’s long-standing investigation into Russia’s possible collusion—by now a wide-ranging, tangled mess of idiocy, intrigue, and hubris.